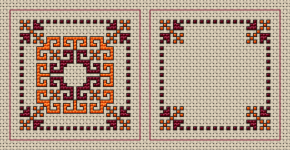 Small pattern of decorative flowers in wine red and light tangerine colors.Suitable for biscornu and other crafts projects. 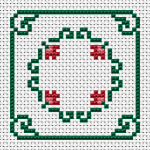 Minimal pattern with roses, designed for biscornu. 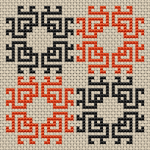 Geometric biscornu motif of four stylized flowers in orange and black. Ideal for beginners, stitched only with full-stitches. Beautiful pattern of morning glory flowers in violet and green. Add more attitude to your reading with this cross stitch bookmark. A simple biscornu with small geometric shapes. Ideal for beginners and requires just two colors. 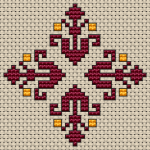 Geometric biscornu pattern in red and yellow designed for 14 count cream fabric. Wonderful vine motif on a dark background designed for 14 count black fabric. 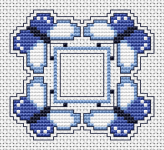 Beautiful design of blue butterflies arranged in a square. 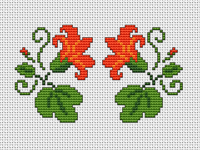 Beautiful bookmark composed of red flowers.Bright tangerine,orange and green colors. 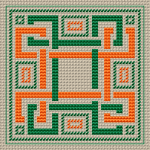 Symmetric floral motif in bright colors:orange,tangerine,green. 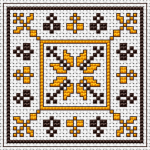 Wonderful geometric design for biscornu or other small crafts projects. 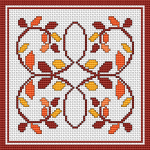 Floral autumn themed design depicting yellow and brown leaves.